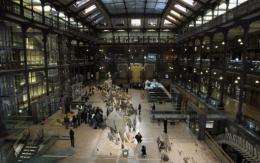 A view of the Galerie de Evolution (Evolution Gallery) of the Museum National d'Histoire Naturelle in Paris. One day 370 million years ago, a tiny larva came to a sticky end when it plunged into a shrimp-infested swamp and drowned. Unearthed in modern-day Belgium, the humble bug now looks set to plug a giant gap in the fossil record. One day 370 million years ago, a tiny larva came to a sticky end when it plunged into a shrimp-infested swamp and drowned. Unearthed in modern-day Belgium, the humble bug now looks set to plug a giant gap in the fossil record. Named Strudiella devonica, the eight-millimetre invertebrate -- while in far from mint condition -- is thought by researchers who published their findings in Nature on Wednesday to be the world's oldest complete insect fossil. "It has everything an insect should have: the legs, the antennae, the thorax and the abdomen," said Andre Nel of France's National History Museum, one of the authors of the study. Scientists until now had few if any confirmed insect fossils from between 385 and 325 million years ago, a period known as the Hexapoda Gap, William A. Shear of Hampden-Sydney College wrote in a comment that accompanied the study. Strudiella devonica could significantly narrow that gap in the fossil record. Based on molecular DNA studies, Nel says scientists had long expected to find insect life dating that far back, but the fossil find yields insight into the evolutionary roots of the insect kingdom. "Insects are an extremely ancient group, but we know very little about the earliest among them," he explained to AFP. "This find enables us to confirm our molecular dating, it's a palaeontological marker." Nel said science "had a grand total of two fossilised mandibles from Scotland to account for the whole Devonian" -- the geological period running from around 415 million to 360 million years ago. From these isolated fossil fragments, some 400 million years old, fast-forward to a period known as the Carboniferous, 300 to 330 million years ago, and the fossil record teems with insects. "In between this profusion of creatures of all kinds -- cockroaches, dragonflies, grasshoppers -- and the earliest specimens, we have nothing," Nel explained. "Yet it was precisely at this time that these animals started to diversify, even started to appear since their ancestors were aquatic insects," he said. With its six-legged thorax, long single-branched antennae, triangular jaws and 10-segmented abdomen, tiny Strudiella devonica is a strong contender for an insect ID card, Shear argues. But he also urges a degree of caution, stressing the study is based on interpretation of a single fossil in relatively poor condition. "What would make it more certain? A better preserved specimen, especially one that showed more clearly the appendages and mouthparts," he told AFP. While the specimen itself does not have wings, the researchers believe that based on the shape of its mandibles -- similar to those of a modern-day grasshopper -- it is probably the larva of a winged animal. If correct, that would also mean that winged insects originated much earlier than available fossils have suggested, Shear said. The fossil was found in a rock slab in a quarry in Belgium, in a strata of very fine, slightly sandy clay -- "probably a land animal that landed in a pond teeming with carnivorous shrimps, and that miraculously escaped being devoured by them," Nel said. But I wish journals and papers stopped referring to evolutionary finds from periods with scant records as filling "gaps". Phylogenetically you have a tree anyway, it is the resolution that increases as you can easier see the tree construction. It is as bad as when you describe finds from transitional series between different traits (say land-living whale ancestors to sea-living whales) as "missing". And we all know how creationists loves to misrepresent the science as "problems, therefore gods" when there is no problem but _increased_ knowledge. But sometimes there are actually problems -- but depending on how deep into the field you are determines if you are aware of them or even understand the science to be able to adequately describe them. As if anyone could possibly be an expert "medical/coroner" level knowledge of each of say 100 different species in just a single sub-section of one branch of the life tree. There a millions of species, maybe more, who's remains we've only found one or no specimens. Then there's discontinuities in the fossil record which can be hard to even detect. Assumptions about one layer in one region don't work in another region or continent. Why are insects so successful and intelligent (ants, bees, wasps) in terms of home building and egg maintenance compared to other species, even though they have almost no brain matter individually? Calling them "inventive" might be an anthropomorphism. I am well aware of the behavior of bees, ants, and other insects... I took a fascinating BIO course in college about insects, but their actions which appear to be highly organized and "clever" may simply be the result of brain development patterns coded into their genes selected due to the evolutionary advantage they confer. To test this would be simple, remove them from their natural environment and put them in an environment where these "clever" actions would actually be detrimental. Do they adjust their behavior to the changed environment or do they just keep doing the same thing over and over again when it does not benefit them any longer? Maybe you could invent an artificial ecosystem like in a biodome or a laboratory where you rig the environment against the organisms primary "inventive" behavior, and then see if/how they adapt. Yeah, I'd be interested to know if any experiments have been done to test this... I can't believe that no one has thought of this before. Trying to think back to that course on insects that I mentioned I don't recall talking about it in particular, but I did do an experiment using Madagascar hissing cockroaches, which are nocturnal, which kept them under bright lights 24/7 and I found they did some interesting things vs. the control group. The group under constant light were more likely to dump their food from its container and to tear up and scatter the moist towels that were in their terrarium and to burrow under the stuff, presumably to shade themselves from the light... which seems rather clever... They also ended up less healthy, losing weight and with higher mortality over the 2 week period. I think I got a B for that project, I should have gotten an A, I think I got some interesting results. I still remember how those little bastards would latch onto you with their sharp legs and then scream at you and tear your skin when you pulled them off... nasty things they are, but the other choices of insects were lame. Creationists shouldn't comment on science, it is hilarious. But even if it was a problem, it doesn't mean that any alternate theories of ideas are correct. That would be the illegitimate logic "A implies B, non-A hence C". For the logically challenged, B can be correct regardless. Creationists must replace basic biology with something that predicts as much as we see and more. They can't do that of course, they claim that females arise out of males (but see any childbirth).